Perhaps there isn’t much space in our own narratives for other stories surrounding North Korean or North Korean policy at the moment than nuclear tests, missile or satellite threats and further moments of tension, distrust and apprehension on the Korean Peninsula. Pyongyang’s capacity to, even at moment of misdirected or confused pique launch a short range weapon at its neighbours certainly concentrates the mind and the priorities of policy makers the world over. A collapse in notions of security and narratological status quo however is not unique to matters simply inter-Korean. As readers and analysts the world over have witnessed the collapse of the Sykes-Picot settlement in Syria in recent years, along with through American indecision the notion of uni-polarity. When it comes to environmental matters, last December apparently saw the coalition of interested parties coming to agreement on a new settlement focused on climate change at Paris, COP21 meeting. While the paucity of what was actually agreed has, in the mind of this analyst at least, not been fairly or comprehensively enough critiqued, the agreement reached in Paris was framed positively at least. As this agreement was dramatically undermined by the United States Supreme Court decision on the possibilities for local ratification, it seemed to this author an interesting moment to stop and think about its implications elsewhere, in a terrain more of interest to those interested in North Korean matters. Pak Pong Ju’s visit to the site of an apparently frozen and wintery Paektusan Youth Hero Power Station, number 3 in February 2016 did not for many illustrate any great international connections or aspirations of North Korea. Pak’s visit perhaps was envisaged as one of a multiplicity of reiterative moments in Pyongyang’s developmental narratives of the early part of the year in which the themes of Kim Jong Un’s New Years Address and the intensive focus on the institutional and ideological frameworks surrounding the Seventh Workers Party Congress are projected and re-projected. The fact that the power station is one of a number in the same geographical area which form part of a Clean Development Mechanism project under the auspices of the United Nations Framework Convention on Climate Change (UNFCCC) might not jump immediately to the viewers mind. Paektusan Youth Hero Power Station, 3’s developmental sibling, Paektusan Songun Youth Power Station, number 2, is just that though. CDM project number 5889 to be exact, part of the post Kyoto institutional and bureaucratic framework that sought at a more ambitious moment to concretise a collective sense that the time was now, to resist or mitigate environmental crisis and global climate change. While analysis from Benjamin Habib and this author has reiterated time and time again that it is an overstatement to ever claim that North Korea saw itself a vanguard nation in the resistance to climate change, it was at least once interested. Paektusan Songun Youth Power Station, and presumably the other hydro-electric infrastructure of Samjiyon County surely attests to that interest. A quick reading of the documentation hosted on the UNFCCC archive which underpins the official approvals for the project and which is required by the Clean Developmental Mechanism (CDM) process suggests a real commitment to not only the aspirations behind the project, but the bureaucratic and conceptual linguistics of the process. While the certification documents’ assertion that local stakeholders were consulted through a series of questionnaires as to their concerns about the environmental impact of the power station may bring a wry smile to the face of many a North Korea watcher, this is Pyongyang rapidly learning the language and form of international engagement. While North Korean efforts to gain accreditation for its CDM projects were certainly contested through the forums of the UNFCCC (though not as heavily contested as Iran’s projects, the last of which only gained accreditation in October, 2015), Pyongyang was of course eventually successful. As readers will know the process that began with North Korean ratification of the Kyoto Protocol in 2005, finally ended on the 23rd of October 2012. CDM project 6949 or Ryesonggang Hydropower Plant No.3, brought Pyongyang’s final total to six CDM projects, around a third of those accredited to the Dominican Republic. Credits due under the CDM process in general will bring in a paltry and declining sum as the system and process tasked with the marketisation of credits for Carbon reduction ossifies and atrophies amidst post-Paris disinterest. This system in reality was never likely to bring enormous value to credit holders as might have once been envisaged, but North Korea’s interest never seemed to be entirely about this. Just as Pyongyang’s Nuclear testing and rocket launches (whether for the aims of ballistic testing or space exploration), are never really entirely about practical development, as much as they are about wider themes of legitimacy and functionality, so North Korean engagement with the CDM process and the Kyoto protocol was about Pyongyang being a global citizen. This author therefore wonders what it does say that, Ryesonggang was the last project in the process of accreditation and that all six finally accredited CDM projects began their bureaucratic process in 2009 under Kim Jong Il. While they were completed in the era of Kim Jong Un, Pyongyang’s under the current Kim has in fact offered little in terms of practical engagement with the process, as determined as Ri Su Yong’s words may appear. Perhaps there is something to be said for institutional focus on the finer details of processes such as the UNFCCC and CDM. While North Korea has been concerned to speak the same institutional language as other nations, even for minimal or elusive gains, Pyongyang may have felt more constrained so far as other more apocalyptic, dramatic or dangerous projections of power were concerned. No doubt it can be proved that just as was articulated by Kim Jong Un as the Byungjin line or parallel approach in 2014, North Korea was engaged in the intricacies of the CDM accreditation at the same time as it was sourcing centrifuges, a twin track of developmental approach. However when even the functioning of the Green Climate Fund can be conceptualised by North Korea as yet another vector for insult and slight, the application of Pyongyang’s bureaucratic and nationalist energies on more positive, if labyrinthine processes would surely be welcomed once more. …Having considered North Korea’s leisure history in order to contextualise both the notion of non-productive or leisurely space under Pyongyang’s remit and to consider some of the political and ideological imperatives which underpin the production and development of such spaces the paper’s narrative arrived at what is essentially a space for families and children. While this paper does in fact address some elements of childhood experience in North Korea and will examine them in the light of these leisurely spaces by the Taedong, it is not the spaces of family that are of interest to this author, but to what might be regarded as the potentially more hidden spaces of the disabled and the orphaned. North Korea has not been known for its kind treatment of those who do not fit within its social and ethical model. Hazel Smith in her recent book ‘North Korea: Markets and Military Rule” for instance expressed astonishment at North Korean census figures from 2010 which at least suggested that teenage or non-normative pregnancy might be a fact in North Korea (recording some 156 births to mothers under the age of 16 in 2010), having never done so before (Smith, 2015, p.231). London’s Paralympic Games in 2012 was the first recorded instance of a disabled athlete competing in public for North Korea and research by this author (Winstanley-Chesters, 2015a), has sought to unpick the connections between this fact and work focused on institutional capacity building between the North Korean Ministry of Health and the United Kingdom’s Foreign and Commonwealth Office. Other nations (both autocratic and democratic) in history have sought to eradicate those who are differently or dis-abled, Nazi Germany of course seeking to exterminate the unfit and the unwell, and Sweden having a long standing policy of forced sterilisation of those with Learning Difficulties and Difference, only ending in the early 1980s being simply two disparate examples. Whether North Korea ever sought by policy means to do so is unknown, but there has been much speculation as to the fate of those who by their physical or mental natures could not hope to be as productive as the general citizenry under Pyongyang’s sovereignty. Of course there is nearly always one category of disabled or differently abled citizens who are not regarded as burdensome by nations or territories, quite the opposite in fact their support and rehabilitation is often seen as a focus of national commitment and social duty, soldiers and people of uniform. There is a huge body of research focused on the functionality and suitability of veterans and service people’s support post combat in a number of sovereignties and nations, but absolutely none it seems addressing North Korean veterans and service people and the provision of services to them. While this paper cannot hope to cover their experience holistically or comprehensively it can at least, with a Geographer’s eye begin to present some of the political and physical terrain of these services and their experience. “You disabled soldiers fought heroically against the US imperialist aggressors and shed your blood to defend the motherland during the last war. It is really admirable that, although seriously disabled, you are taking an active part in the building of socialism” (Kim Il-sung, 1958, p.214). Kim Il-sung’s statement, recorded in the Works series for 1958 as “We must take good care of disabled soldiers who shed their blood in the fight for the country and the people”, and apparently given at a workshop for disabled soldiers is the foundation statement so far as North Korean ideological conceptions of disabled ex-employees and service people is concerned. While a tremendous debt is acknowledged to those who have become disabled through military combat for their nation (“We must scrupulously look after the disabled soldiers in every respect so that they will not suffer any inconveniences both in life and in work” (Kim Il-sung, 1958, p.214), the individuals themselves are not absolved from commitments to the national cause, nor the strictures of revolutionary fervour. Disabled soldiers should, even in this space and place of refuge, work and be as productive as possible: “…you should do some work. Yet, you should never overwork yourselves. It will be good to work as much as necessary to keep yourselves fit.” (Kim Il-sung, 1958, p.216). Given this apparent focus on productivity and as an example to be followed, those who were resident in this particular workshop were to be amply supplied to enable their work; “The disabled soldiers here want more fruit gardens. So it will be a good thing to give them the state orchard in the vicinity of the workshop…The disabled soldiers should be supplied with both fuel for production and firewood for home use” (Kim Il-sung, 1958, p.2014). As with other citizens of North Korea, the disabled should be supported further in their education and personal development, and prejudice which might be problematic to that end be resisted: “Now a comrade claimed that once he went to a school for disabled soldiers, only to be rejected and returned back because he had arms missing. The cadres at the school did the wrong thing. Could it be that one who has no arms cannot study?” (Kim Il-sung, 1958, p.216). Disabled ex-service people within the text are widely anticipated to engage in education at all levels and within all institutional structures provided. However, along with work itself, disabled soldiers and service people who have essentially fought for the North Korean revolution (within this text, the fighting which disabled them would have been during the 1950-1953 war against United Nations and Republic of Korea forces), should not neglect or forget that revolution. The Disabled must be as good and as ideologically sound North Koreans as any other, as committed and as respectful of its revolutionary traditions as they were during their combat: “Disabled soldiers should always love the people and hate only the enemy. As you fought well and courageously for the motherland and the people on the battlefields in the past, you should today continue to have the same revolutionary spirit…” (Kim Il-sung, 1958, p.217). With this revolutionary spirit and commitment comes an ethical framework familiar surely to all North Korean political and Party appointees: “Our disabled soldiers should lead a simple life and always live in a revolutionary way. Under no circumstances should they drink alcohol and say things under its influence…” (Kim Il-sung, 1958, p.217). Such spaces of refuge and support for the once militarily committed are of course therefore not to be spaces of refuge from the politics of North Korea and the demands of revolutionary ideology. In a sense past examples such as Kiluiju Disabled Soldiers Production Workshop are a reflection and a projection of this into the contemporary era and into the impetus and imperatives which underpin North Korean healthcare more generally. ‘On Making Good Preparations for Universal, Free Medical Care’ for instance a 1952 instruction from Kim Il-sung, and one of a number focused on the post Korean War rehabilitation of a devastated if optimistic North Korean bureaucracy and the form of state and infrastructure anticipated in the post War era, contains a pre-figuring of the sort of support and impetus behind such projects for the disabled. “Nothing is more precious to us than the lives of the people. At present our people are struggling both at the font and in the rear dedicating all they have to final victory in the war. What is it that we cannot spare people who fight selflessly, displaying noble patriotism and mass heroism” (Kim Il-sung, 1952, p.19). While the terrain of Kiluiju Disabled Solders Production Unit of course is now in the distant historical past of North Korea and either photos nor contemporary reportage other than that recorded in Kim Il-sung’s Works and Selected Works are very difficult to access, North Korea’s ideological course as only consolidated institutional focus around the needs of military infrastructure and personnel in recent years. 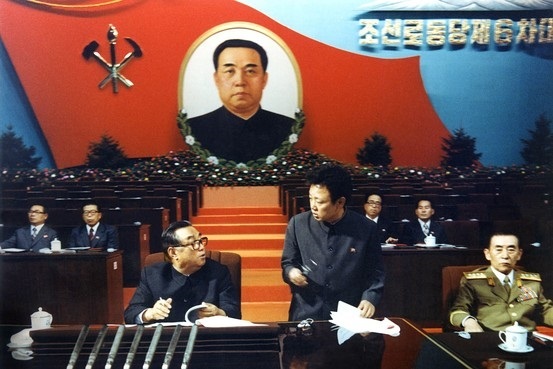 Kim Jong-il’s development of a Songun or Military First politics following the death of his father in 1994 entailed the wholescale revision of Party and governmental policy as well as institutional capacity. Food distribution, rationing and health infrastructure were heavily focused on supplying and supporting North Korea’s military. The infrastructure focused on the refuge of the elderly and the disabled has similarly developed, though with definite connections to the past calls for those resident to live productive and revolutionary lives, well emplaced within the wider superstructures of North Korean politics and ideology. Pyongyang’s newly built ‘Home for the Aged’ is just such a piece of infrastructure. Amongst the pleasure and leisure spaces introduced earlier in the paper on the banks of the Taedong River, the Home for the Aged was completed and opened in early August 2015 (KCNA 2015a). While the images presented in the Rodong Sinmun (Rodong Sinmun 2015b) and KCNA (KCNA 2015a), undoubtedly present the home as part of Pyongyang and North Korea’s modern urban infrastructure and development and very much an element of governmental bequest in the age of Kim Jong-un, the reportage leading up to its opening makes very sure to connect to earlier eras and the revolutionary authority (Kwon and Chung, 2012), present within the historical narrative. Kim Jong-un for instance on visiting the still under construction building in March of 2015 is recounted as having; “…recalled with deep emotion that President Kim Il-sung, together with leader Kim Jong-il, visited an old service people’s home in Manal-ri, Sungho County in May 1948 when he was busy paving an untrodden path for nation-building and showed deep emotion for the inmates living conditions…saying that the state would take warm care of the aged…” (Rodong Sinmun 2015a). The home and its construction is also firmly fixed in the governmental and bureaucratic ecosystem of North Korea, reportage and documentation focused on the process paying both homage and careful articulation to/for the respective positions of both the Workers Party of Korea and the Korean People’s Army. Kim Jong-un remarked for instance during his March visit that “to build the home for the aged well is a very important work in correctly implementing the Worker’s Party of Korea’s policy for the care of the elderly and fully displaying its validity and vitality” (Rodong Sinmun, 2015a) and also, in a nod to the military’s role in its construction “expressed belief that the soldier-builders would successfully complete the construction of the home by late June, true to the intention of the Party Central Committee” (Rodong Sinmun, 2015a). As a space of refuge and care for the disabled, elderly and disabled service people, Pyongyang’s new Home for the Aged is in summary presented as a space of comfort and refuge meant it seems to be in tune with some of the more comforting and less rigorous elements perhaps seen in Nursing Homes and accommodation or refuge spaces for the elderly in the United Kingdom and elsewhere (particularly the Netherlands developing network of Alzheimer’s Villages, in which the environment residents are placed is designed to reflect their own social constructs and life experience (Henley, 2012)). Kim Jong-un notes for example on its opening that “the home was successfully build to suit national character and flavour…dining rooms were constructed to create homelike atmosphere” (Rodong Sinmun, 2015b). However the terrain of the Home of the Aged is also presented as one of acute and definite modernity, in tune with many of the governmental priorities and agendas of the day. Kim Jong-un himself remarks that “the longer one watches, the more fashionable it looks” (Rodong Sinmun, 2015b) and that in common with the infrastructure created in the 1950s to support not only the physical rehabilitation, but the political and social rehabilitation of disabled and injured service people, the home’s residents will not be allowed or afforded the opportunity to neglect their personal development. Kim Jong-un’s opening speech includes the assertion that “…service and healthcare establishments including barber’s, beauty parlor, bath and treatment rooms look impeccable and library, sporting room and amusement hall were also successfully built for the cultural and emotional life and physical training of health seekers” (Rodong Sinmun, 2015b). While their social and revolutionary health will be maintained, it will of course be done so in a structure that is environmentally friendly and ecologically sound in the manner that North Korea presents much of its infrastructural development in recent years; “an air conditioning system by use of geotherm is introduced into the home…and greening is it environment done very well” (Rodong Sinmun, 2015b). Armstrong, Charles. 2002. “The Origins of North Korean Cinema: Art and Propaganda in the Democratic People’s Republic.” Acta Koreana 5,1: 1-19. Armstrong, Charles. 2011. “Trends in the Study of North Korea.” The Journal of Asian Studies 70, 2: 357-371. Berthelier, Benoit. 2015. “Collective Identities and Cultural Practices in the North Korean Movement for the Popularization of Arts and Letters (1945-1955), Conference Paper delivered at the Association for Korean Studies in Europe annual conference, July 2015, Bochum, Germany. Burgoyne, Susan. 1969. “The World Youth Festival”, Australian Left Review 1, 17: 45-49. Cha, Victor. 2012. North Korea: The Impossible State. London: The Bodley Head. De Ceuster, Koen. 2003. “Wholesome Education and Sound Leisure: The YMCA Sports Programme in Colonial Korea.” European Journal of East Asian Studies 2,1: 53-88. Dobrenko, Evgeny. 2007. The Political Economy of Socialist Realism. New Haven: Yale University Press. Fahy, Sandra. 2015. Marching Through Suffering: Pain and Loss in North Korea. New York Cit, NY: Columbia University Press. Henley, John. 2012. “The Village Where People have Dementia…and Fun”, The Guardian, 27th August, 2012, accessed 15th December, 2015, http://www.theguardian.com/society/2012/aug/27/dementia-village-residents-have-fun. Kim Il-sung. 1947. “On Improving the Public Health Service.” Works. Vol 2. Pyongyang: Foreign Languages Publishing House. Kim Il-sung. 1951. “On Some Questions of Our Literature and Art.” Selected Works Vol. 1. Pyongyang: Foreign Languages Publishing House. Kim Il-sung. 1952. “On Making Good Preparations for Universal Free Medical Care.” Works. Vol 6. Pyongyang: Foreign Languages Publishing House. Kim Il-sung. 1953. “Everything for the Postwar Rehabilitation and Development of the National Economy.” Works. Vol 7. Pyongyang: Foreign Languages Publishing House. Kim Il-sung. 1958. “On the Immediate Tasks of City and Country People’s Committees.” Selected Works Vol. 2. Pyongyang: Foreign Languages Publishing House. Kim Il-sung. 1958. “We Must Take Good Care of Disabled Soldiers Who Shed Their Blood In the Fight for the Country and the People.” Works. Vol 12. Pyongyang: Foreign Languages Publishing House. Kim Il-sung. 1966. “Let us Produce More Films Which are Profound and Rich in Content.” Works. Vol 20. Pyongyang: Foreign Languages Publishing House. Kim Il-sung. 1966. “The Communist Education and Upbringing of Children is an Honourable Revolutionary Duty of Nursery School and Kindergarten Teachers.” Works. Vol 20. Pyongyang: Foreign Languages Publishing House. Kim Il-sung. 1972. “On Developing Physical Culture.” Works Vol 27 .Pyongyang: Foreign Languages Publishing House. Koh, Byung Chul. 2005. “’Military-First Politics’ and ‘Building a Powerful and Prosperous Nation’ In North Korea.” Nautilus Institute. http://nautilus.org/napsnet/napsnet-policy-forum/military-first-politics-and-building-a-powerful-and-prosperous-nation-in-north-korea/. Accessed January 30 2015. Kurbanov, Sergei. 2015. “North Korea One Year Before the 13th Festival of Youth and Students: Trends and Changes”, Conference Paper delivered at the Association for Korean Studies in Europe annual conference, July 2015, Bochum, Germany. Kwon, Heonik and Byung-ho Chung. 2012. North Korea: Beyond Charismatic Politics. Lanham: Rowman and Littlefield. Kwon, Heonik. 2013. “North Koreas New Legacy Politics.” E-International Relations, May 16th, 2013, http://www.e-ir.info/2013/05/16/north-koreas-new-legacy-politics/. Myers, Brian. 2012. The Cleanest Race: How North Koreans See Themselves and Why It Matters. New York: Melville House. Myers, Brian. 2015. 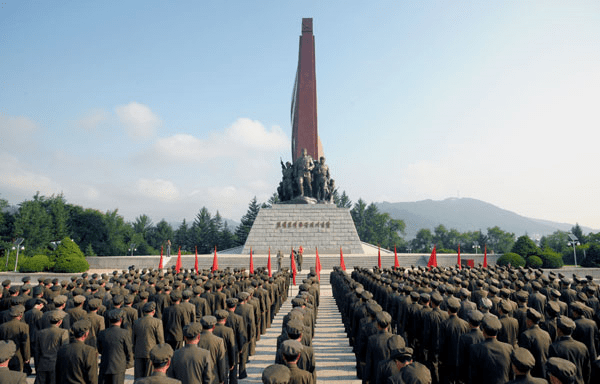 North Korea’s Juche Myth. Seoul. Sthele Press. Rodong Sinmun. 2014. “Hamhung Water Park Built Newly,” Rodong Sinmun, January 4, 2014, accessed January 22, 2015, http://www.rodong.rep.kp/en/index.php?strPageID=SF01_02_01&newsID=2014-01-04-0034&chAction=S. Rodong Sinmun. 2015b. “Kim Jong-un Provides Field Guidance to Newly Built Pyongyang Home for Aged”, Rodong Sinmun, August 3rd, 2015, accessed 15th December, 2015, http://www.rodong.rep.kp/en/index/php?strPageID=SF_02_01&newsID-2015-08-03-0016. Rodong Sinmun. 2015d. “Kim Jong-un Provides Field Guidance to Wonsan Baby Home and Orphanage Close to Completion”, Rodong Sinmun, April 22nd, 2015, accessed 15th December, 2015, http://www.rodong.rep.kp/en/index.php?strPageID=SF01_02_01&newsID=2015-04-22-0016. Rodong Sinmun. 2015e. “Kim Jong-un Provides Field Guidance to Wonsan Baby Home and Orphanage”, Rodong Sinmun, June 2nd, 2015, accessed 15th December, 2015, http://www.rodong.rep.kp/en/index.php?strPageID=SF01_02_01&newsID=2015-06-02-0018. Smith, Hazel. 2015. North Korea: Markets and Military Rule. Cambridge: Cambridge University Press. Winstanley-Chesters, Robert. 2014. Environment, Politics and Ideology in North Korea: Landscape as Political Project. Lanham: Lexington Books. Winstanley-Chesters, Robert. 2015a. “The Socialist Modern at Rest and Play: Spaces of Leisure in North Korea.” Academic Quarter, 11 (Summer 2015): 196-211. Winstanley-Chesters, Robert. 2015b. “’Patriotism Begins with a Love of Courtyard’: Rescaling Charismatic Landscapes in North Korea.” Tiempo Devorado (Consumed Time), 2 (2015): 4-26. The seemingly acute developmental concern of the Young Leader, Kim Jong-un has been fairly, if intriguingly clear since his accession to the throne of charismatic Kimism on the death of his father at Christmas 2012. While of course much theatrics have since ensued, enrapturing a great many a Pyongyangologist and sports fan, the pedagogy and education of his later youth in Switzerland surely cannot amongst the Michael Jordan DVDs have included much in the way of environmental training. But developmentally focused, Kim Jong-un has rather oddly been. In between those Dennis Rodman visits and the requisite number of appearances next to military hardware and sites of commemoration for his grandfather and father, he has found the time and inspiration to write a number of narratologically at least informative texts on such matters. From his first “On Bringing About a Revolutionary Turn in Land Administration in Line with the Requirements of the Building of a Thriving Socialist Country” delivered in April 2012, to his instructive tome on institutional and bureaucratic matters to a group of Agricultural ‘subteam’ workers in 2013 to the New Years Messages of 2014 and 2015 focused respectively on recounting the anniversary of 1964’s Rural Theses and the topography of nationalist, foundational struggle at Paektusan, Kim Jong-un as ploughed a very individual and distinct developmentalist furrow. 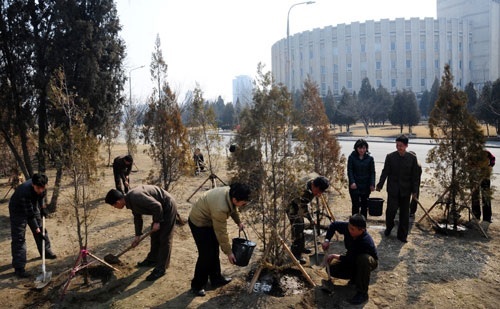 Kim Jong-un’s latest piece of apparently long form authorship will also not surprise the reader given the political and bureaucratic commemorative calendar of North Korea and the fact that National Tree Planting Day arrives early on March 4th followed by the highly important Spring Land Management Campaigns. This author has also covered this aspect of the yearly cycle of institutional impetus and charismatic connection before, as the period is marked and remarked upon nearly every year. However while the moment is indeed frequently noted, it is still rare for such an extensive statement to be made. Surely positive words to the ears of provincial administrators everywhere, these opening remarks in the text are alas, for that audience, the last of reassurance and charismatic comfort. Kim Jong-un goes on to complain that “…people have felled trees at random since the days of the Arduous March on the plea of obtaining cereals and firewood and, worse still, as no proper measures have been taken to prevent forest fire, the precious forest resources of the country have decreased to a great extent…” These claims, that on the face of it sound akin to critiques of Korean approach to forest and timber resource from both the days of the Government General of Chosen and a disappointed Park Chung-hee on his return from a verdant Japanese mainland come finally complete with a denunciation of bureaucratic efforts and focus on aboreal matters. The achievement of this patriotic developmental outcome, of course given all of that apparent stasis and stagnation will be no mean feat. One would imagine it would require complete institutional revision and dramatic reconfiguration of the approach and structures of its forestry sector….Imagination of course predicated on the social and cultural context of the imaginer, and North Korea’s particular weltanschaung is, if not unique, certainly distinct. This Kim Jong-un’s outlined solutions and framework appear a smorgasbord of derivations and tendencies sourced from throughout its political, sovereign and developmental history. Held in common with a great many other elements of North Korean politics and ideology however, and which is now commonly understood by analysts and scholars focusing on such matters it will essentially also be whatever and what if what is required, not just in developmental or functional terms, but will also need to address narrative and commemorative purposes. 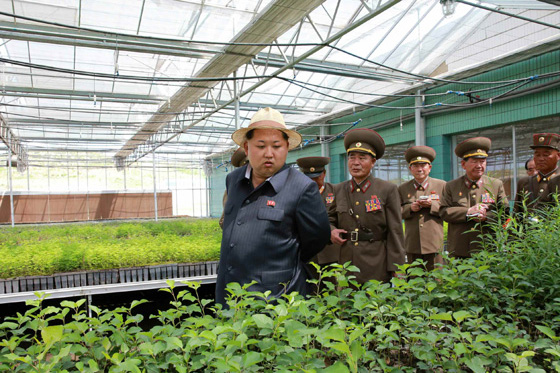 In a sense if it were to be followed, Kim Jong-un’s suggestions of increased developmental knowledge exchange with the wider world, more focus on empirical rigour within the sector, and better organised, nationally aware but locally focused institutions and bureaucracies might make a real difference to the functionality and viability of forest resource in North Korea, as such an approach would in any nation. However of course within Pyongyang’s sovereign realm there are other forces and agendas at play, so these fairly rational scientific platitudes must be matched to commemorative and legitimatory narratives and practices. Just as urgency is deployed in the scientific realm, so it will be utilised within the charismatic. Kim Jong-un within later sections of the document reverts to what we might term the revolutionary mean. Here politics and functional development are undertaken by ‘the mass’ as Chairman Mao would have understood it, one homogenous, energetic, powerful yet not necessarily functional assemblage of co-opted, coerced and perhaps the enthusiastic publics. 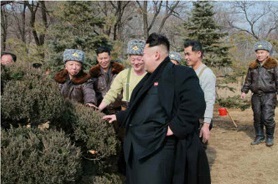 Kim Jong-un suggests for instance that “It is our Party’s traditional method of work to propel the revolution and construction by means of mass-based movements”, before comparing whatever projects must be undertaken to redevelop and regenerate North Korea’s forestry stock to projects and campaigns such as the Ch’ollima movement, projects whose difficulties this author has considered at some length. Perhaps ultimately the charismatic and commemorative inclination of the mass is what prevents Kim Jong-un from moving on to pastures or timbers new within this key text. As much as it would make sense to leave forest development up to the nurseries, to the Forest Academy to the local bureaucracies tasked with increasing stock in their domain, North Korean politics is nothing without its key institutional base of Party, Army and a perceptual (if not perhaps real) popular mass. 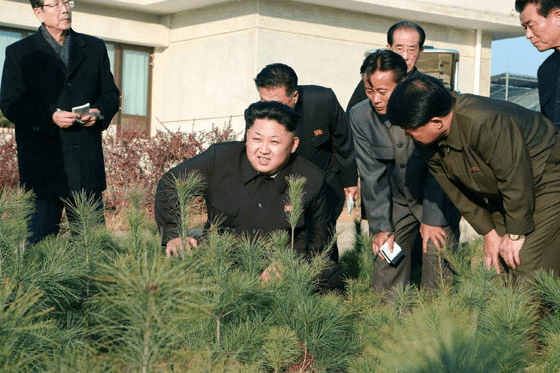 When Kim Jong-un begins to make assertions that “Only when the whole country and all the people are involved, can the forest restoration campaign bear fruit…” It cannot be surprising that the phrase “…as they conducted reconstruction after the war” should follow. Ultimately and in conclusion it seems that however far Kim Jong-un might want to reach in systematic arboreal terms, in this text he proves himself trapped by the weight of history and its necessary recantations and representations. Developmentally trapped by the weight of fighting eternal theoretical and metaphorical war as the Young Leader can only conclude that “…nurseries are to a forest restoration campaign what munitions factories are to a war…” we must conclude that in this instance of forestry and timber resource, developmentally Pyongyang finds itself trapped by a Patriotism of its own perception. The seemingly acute developmental concern of the “Respected Marshall” Kim Jong-un has been fairly, if intriguingly, clear since his accession to the throne of charismatic Kimism on the death of his father in December 2011. Amid the ensuing theatrics, speculation over the pedagogy Kim Jong-un received during his later youth in Switzerland has not been terribly serious, focusing more on the influence of Michael Jordan rather than lingering on any possibility of environmental training. But, rather oddly and nevertheless, Kim Jong-un has been developmentally focused. In between his now-standard appearances next to military hardware, sites of family commemoration, and the odd visit from Dennis Rodman, Kim Jong-un is now presented as having found the time and inspiration to write a number of texts on developmental matters. While these texts do not betray an in-depth, empirically grounded knowledge of science or environmental process, they are surely informative from a narratological perspective. Kim Jong-un has ploughed a very individual and distinct developmentalist furrow, starting with his first work delivered in April 2012. Entitled “On Bringing About a Revolutionary Turn in Land Administration in Line with the Requirements of the Building of a Thriving Socialist Country,” the essay sparked speculation outside of North Korea that the young leader had a kind of possibly reformist zeal, while internally, the essay became a touchstone for North Korean officials concerned with land management. Kim Jong-un then moved on instructively into institutional and bureaucratic matters for a group of agricultural “subteam” workers in 2013. His New Year Messages of 2014 and 2015 then focused, respectively, on celebrating the anniversary of 1964’s Rural Theses and climbing the topography of nationalist, foundational struggle on the volcanic heights of Baekdusan. This latest piece of long-form apparent authorship comes at a fitting moment during the political and bureaucratic commemorative calendar of North Korea. National Tree Planting Day arrived early on March 4, and has been followed by the highly important Spring Land Management Campaigns. I have in the past considered these aspects of the yearly cycle of institutional impetus and charismatic connection, as the period is marked and remarked upon nearly every year. Yet, although the moment is indeed frequently noted, it is still rare for such an extensive statement to be made. Forests are precious resources of the country and a wealth to be handed down to posterity. Our country has been called a land of golden tapestry for the mountains thick with forests and the fields covered with beautiful flowers. [Under] Japanese imperialist colonial rule, [Kim Il-sung had] unfolded a far-reaching plan to turn all the mountains into thickly wooded places of people’s resort by having trees planted in large numbers. Surely positive words to the ears of provincial administrators everywhere, these opening remarks in the text are, alas, for that audience, the last of reassurance and charismatic comfort. People have felled trees at random since the days of the Arduous March on the plea of obtaining cereals and firewood and, worse still, as no proper measures have been taken to prevent forest fire, the precious forest resources of the country have decreased to a great extent. On the face of it, such statements sound akin to critiques of Korean approaches to forest and timber resource from the days of the Government General of Chosen. Not only that, but they very much echo the tone set by a disappointed Park Chung-hee on his return from a verdant Japanese mainland, as much as they mirror critical commentary from Kim Jong-un’s grandfather. This denunciation of bureaucratic efforts and focus on arboreal matters clearly has multiple precedents. As the mountains are sparsely wooded, even a slightly heavy rain in the rainy season causes flooding and landslides and rivers dry up in the dry season; this greatly hinders conducting economic construction and improving people’s standard of living. Despite this, our officials have confined themselves to reconstructing roads or buildings damaged by flooding, failing to take measures for eliminating the cause of flood damage by planting a large number of trees on the mountain. The achievement of this patriotic developmental outcome, given all of the apparent stasis and stagnation that surrounds it, will be no mean feat. One would imagine it would require nothing less than a complete institutional revision and dramatic reconfiguration of the approach and structures of its forestry sector. The entire Party, the whole army and all the people should conduct a vigorous forest restoration campaign to make the mountains of the country thick with forests…. Forest restoration is a challenging and complex undertaking of raising young trees, transplanting them and then cultivating them year in, year out in the face of harsh challenges of nature…. The forest restoration campaign is a war to ameliorate nature. We should take measures to introduce and widely disseminate the global achievements of the advanced science and technology related to forest planting and conservation…we should bring in… trees from foreign countries and widely proliferate them. The reality and rationality of charismatic empiricism | Further to this call to global connection, and to this author even more surprising, is Kim Jong-un’s demand for the embedding of these externally sourced conceptions within local institutions and frameworks. As he puts it, “a brisk drive for disseminating forest science and technology should be waged to keep people abreast of the world trend of development of forest science and technology.” In other words, Kim is seeking increased developmental knowledge and exchange with the wider world, more focus on empirical rigor within the sector, and better organized, nationally aware but locally focused institutions and bureaucracies. If they were to be followed, Kim Jong-un’s suggestions might make a real difference to the functionality and viability of forest resource in North Korea, as such an approach would in any nation. However within Pyongyang’s sovereign realm there are other forces and agendas at play, so these fairly rational scientific platitudes must be matched to commemorative and legitimating narratives and practices. Just as urgency is deployed in the scientific realm, so it will be utilized within the charismatic. Within later sections of the document, Kim Jong-un reverts to what we might term the revolutionary mean. Here politics and functional development are undertaken by “the mass” as Chairman Mao would have understood it: One homogenous, energetic, powerful yet not necessarily functional assemblage of co-opted, coerced and perhaps enthusiastic publics. Kim Jong-un suggests, for instance, that “it is our Party’s traditional method of work to propel the revolution and construction by means of mass-based movements;” he then goes on to compare whatever projects must be undertaken to redevelop and regenerate North Korea’s forestry stock to projects and campaigns such as the Chollima Movement. Perhaps ultimately the charismatic and commemorative inclination of the mass is what prevents Kim Jong-un from moving on to new pastures (or new timbers, as it were) within this key text. As much as it would make sense to leave forest development up to the nurseries, from the Forest Academy to the local bureaucracies tasked with increasing stock in their domain, North Korean politics is nothing without its key institutional base of Party, army, and a perceptual (if perhaps not real) popular mass. 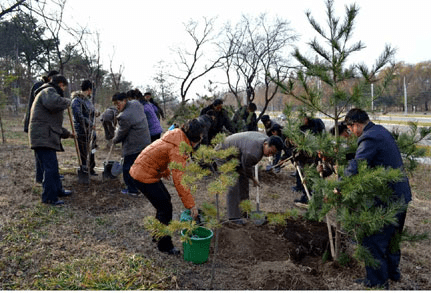 When Kim Jong-un begins to make assertions that “only when the whole country and all the people are involved, can the forest restoration campaign bear fruit” it cannot be surprising that the phrase “as they conducted reconstruction after the war” should follow. The purpose of the exercise is not merely to reforest the landscape, but to activate and reiterate the mobilizing center, with connections to both Party and Army, centered upon Kimist authority and the embodied narrative of resistive national struggle. Ultimately it seems that however far Kim Jong-un might want to reach in systematic arboreal terms, in this text he proves himself trapped by the weight of history and its necessary recantations and representations. Developmentally trapped by the weight of history in engaging in North Korea’s recurrent theoretical, narratological and metaphorical hostilities, the Young Leader can only conclude that “nurseries are to a forest restoration campaign what munitions factories are to a war.” We must conclude that in this instance of forestry and timber resources, developmentally Pyongyang finds itself incarcerated by a patriotism of its own perception. Thanne longen folk to goon on pilgrimages…. Chaucer’s narrative of happy, hapless, challenged, and occasionally pious 15th century pilgrims to the shrine of Thomas Beckett at Canterbury is temporally, linguistically, and politically a world away from the snow covered Amnok and Tumen river basins of the 1920s. I do not seek to make any connection between the two, for none can be made other than to reconfirm the cultural importance of what was known to Chaucer and those of his age as “pilgrimage.” While pilgrimage, as both concept and action, has not faded from the repertoire of cultural practice (Lourdes, Santiago di Compostella and Uman in the Ukraine being relevant contemporary examples), in recent years some of the energy deployed has dissipated away to the field of secular culture and politics. Pilgrimage has obvious advantages; it carves out temporal spaces in busy human lives and creates safe, shared groupings with which to journey. But perhaps the key feature of the act as it has been transmitted to secular form lies in its utility as a vessel for the carrying, sustaining, and socialization of memory. In Britain, for example, annual commemoration of the birth of trade unionism in the village of Tolpuddle recalls the Tolpuddle Martyrs, eulogizing their struggle and transportation whilst re-temporalizing and re-territorializing the process, narrative and context of the period. The Sun of Pyongyang: Deterritorialization | Anyone who focuses on North Korea will be well aware of the political conceptions that surround the country’s founding leadership and its existing state. Kim Il-sung, the first President of the Democratic People’s Republic of Korea, is also the last as he holds permanent office. This extra-territorial, post-physical state allows Kim to serve abstract, esoteric functions in the North Korean political structure; as a vessel for memory and a carrier signal for charismatic authority. As Pyongyang’s “Sun,” Kim permanently radiates beneficence, care, and inspiration upon the topography and territory of North Korea, subject to the impact of neither physical nor temporal change. However, the citizens of Pyongyang, no matter how politically engaged or institutionally connected they may be, live in concrete space and time. They are, therefore, potentially disconnected in vital ways (from a North Korean institutional perspective) from this font of ideological and philosophical inspiration. Addressing this matter requires a multiplicity of tools through which the state re-establishes the connection between Sun and people; by constant exposure to government narrative, the virtual omnipresence of images of the Kims, and studied celebration of waypoints in the narrative of the dynasty. To all intents and purposes, commemorative days serve as North Korean “Saints Days;” crystallizations of supra-temporal, esoteric streams of narrative charisma. The nature of Pyongyang’s mythos has been explored many times before; however, it also requires mythography. We have encountered this in other fascinating academic analysis. What has not been addressed is what seems to be a developing tendency to provide opportunities and spaces for North Korean citizens to encounter the charismatic energies produced by these ‘deterritiorializings‘ and ‘de-temporalizings’ for themselves; to walk theatrically in the footsteps of the nationalist past. Across Frozen Rivers: Pedagogical Charismatic Journey | Far from the “shoores” of April and perhaps closer to the “droght” of March, Kim Il-sung’s crossing, according to current North Korea narratology, occurred in an icy January 1925 over the frozen waters of the Amnok (Yalu) River. It was this crossing which began the period of exile from which so much of Kimist authority and charisma derive. Naturally, this moment is already subject to much memorialization. This year marks the ninetieth anniversary of the act, and as such this obsession with anniversaries and commemoration was bound to be an important moment for political and ideological reiteration. 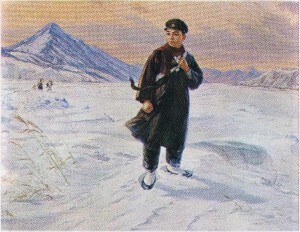 On January 22, Juche 14 (1925) Kim Il-sung started the 250-mile journey for national liberation from his native village Mangyongdae to the Northeastern area of China. During the journey he made up the firm will to save the country and the nation deprived by Japanese imperialism. New history of modern Korea began to advance along the unchangeable orbit of independence, Songun and socialism. 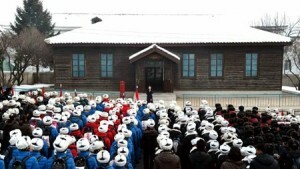 Respected Marshal Kim Jong-un is wisely leading the work to ensure that the sacred tradition of the Korean revolution started and victoriously advanced by Kim Il-sung and Kim Jong-il is given steady continuity… calling on the school youth and children to hold them in high esteem as the eternal sun of Juche and carry forward the march to Mt. Baekdu to the last. How would these school children hold this “sacred tradition” in esteem: Passive participation in a Workers’ Party meeting? The singing of songs and poems dedicated to nationalist urgency? Appearing slightly overawed and/or afraid next to the Young Generalissimo during on-the spot guidance? No, it would in fact be none of these, but something far stranger. Instead of abstraction and narrative opacity, there would instead be a period of acute reterritorialization on the pages of Rodong Sinmun, in the output of KCTV and, for a time, on the streets and paths of South Pyongan Province. 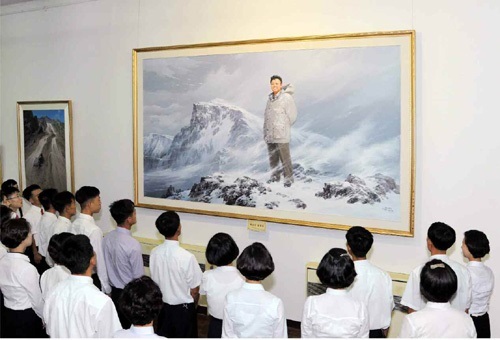 The process for the schoolchildren’s selection, the nature of the institutions from which they came or their ages, elements which might support a really coherent, cogent, and convincing re-enactment process, are never stated in Rodong Sinmun reporting of the enterprise. Yet the physicality of their journey is clear and important to the narrative. This physicality, common to pilgrimages elsewhere, in which breaks, pauses, and stops must be taken, one imagines to rest the tired legs of the children after crossing “one steep pass after another,” is clear to the reader. These are presented as real children of North Korea in 2015, not cyphers for the pre-Liberation, nationalist past; they are presumably revitalised by their intersection with ideological energy. In keeping with Deleuze and Guattari’s notion of deterritorialization, the spaces and practices of relation within the frame of the journey are as important as its starting point, route and destination, a fact in common with earlier narratives of North Korean historiography (which will be encountered in one of the sister pieces to this essay). 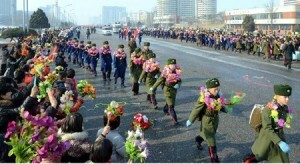 Though these children walk the route of the commemoration of North Korean revolution and liberation in 2015, the relational praxis encountered is that of 1925. Whatever these children think in the quieter moments of their own particular everyday (perhaps watching South Korean TV dramas on smuggled in USB sticks, helping their parents engage in furtive transactions at semi-legal markets, or just coping with the mixed ennui of resignation, exasperation and desperation produced by interaction with state institutions), the social and personal context of those dark days of the late 1920s is activated by their every footstep. Their breaks would include hearing the “impressions of the reminiscences of anti-Japanese guerrillas,” and beginning their march again they would become, represent, and even channel the aspirations of those same guerrillas. It seems that having departed Pyongyang on January 22, the children arrived at their (and both Kim Il-sung and Kim Jong-il’s) destination, Phophyong in Ryanggang Province around February 4. Phophyong, they say, was the site of Kim Il-sung’s momentous crossing of the Amnok River, the site where the young man would transition from subjugated Chosun with its political frame of colonisation to resistance on the wild fringes of Manchuria and a new frame of personal and political liberation and struggle. To Phophyong: And Beyond? | What is most intriguing is the location of this territory at the edge of the state. The school children arrived at Phophyong, a place famous in local history and culture as one of subjective transfer, of existential passage from one mode of relation to another, a place of crossing… and yet they did not cross. Perhaps in these days of strained relations between Beijing and Pyongyang such charismatic commemorations cannot be enacted on both sides of the sovereign boundary. Given the importance of North Korea’s ideological omnipresence, perhaps they could in any case never be undertaken in a different political space. But the acute re-territorializing of the contemporary everyday beyond the shore of the river at Phophyong leaves our narrative, their narrative, in a distinct disconnect, a functional void. How are we to fill that void? Forecasting the genuinely new in an annual message from North Korea’s Supreme Leader is to anticipate category failure and disappointment. Novelty by definition requires the potential for change or difference… and contemporary North Korea has never been marked by either. It seems that no matter how much it is wished for and conceptualized, Pyongyang has deflected, co-opted, negativized or outright ignored potential challenges to the core of its system. Nevertheless, that does not mean that the New Year’s Address can be discounted. The 2014 New Year’s Address was acutely demonstrative of the genre’s form as a ‘directional beacon’ highlighting the narrative and developmental direction of the state for the coming year. Where 2013 had been a year of multiple revolutionary speeds, Masik Pass and other megaprojects, so 2014 focused on a key text from Pyongyang’s developmental history: 1964’s Rural Theses on the Solution to the Socialist Rural Question, a conceptual linchpin of practical and ideological progress in agriculture during a more governmentally coherent (though no less difficult) period in North Korean history. The return of the Rural Theses in 2014 suggested a structural cohesiveness to the developmental strategy of the Kim Jong-un government that, of course, may not really be present (a fantasy on the part of Pyongyang agricultural institutions); but, vitally, it politically underpinned the developmental goals of the Address. Like most North Korea watchers, I was caught unawares by the prominence of the Rural Theses in the 2014 speech, in-spite of having written a considerable portion of my recent monograph on their structure and impact. The anniversary had not seemed significant. The 2014 Address sought to move on from the construction of dramatic megaprojects such as the Masik Pass Ski Resort, applying the Theses’ charismatic impetus to programs that had seemed fairly esoteric and diffuse, such as the Sepho Grassland Reclamation Project. Doing so appeared to be an exercise in reinforcement of their potential, which had hitherto appeared tenuous at best. 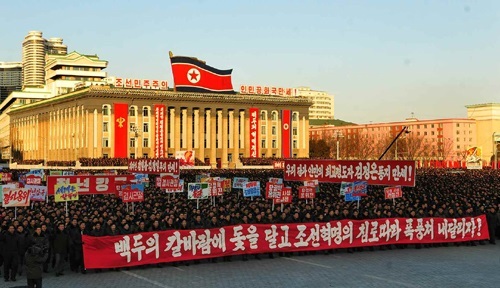 The North Korean media continued to make reference to the Theses and their place in the New Year’s Address for much of the year, with mentions in Rodong Sinmun as late as the end of October. Caught between the Tides: Predicting 2015 | In the lead up to January 1 this year, I racked my brain and delved deep into Kim Il-sung’s Works in search of agricultural/developmental focal points around which Kim Jong-un’s statement could coalesce. Of course, environmental historians of North Korea will be aware that the next significant developmental publication following the publication of the Rural Theses in 1964 was 1968’s ‘For the Large-scale Reclamation of Tidelands’. Therefore, lacking an obvious textual anniversary for 2015, the potential of the coming January remained a mystery. 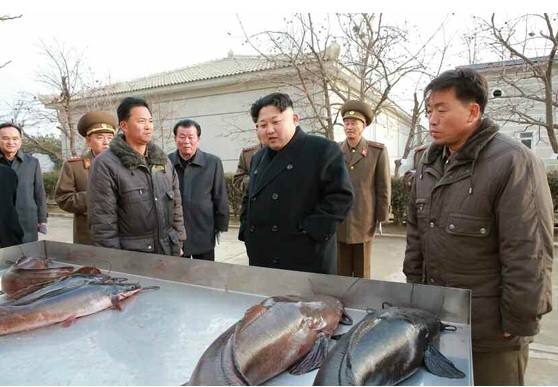 Kim Jong-un’s message of January 1, 2015 heavily focuses on narrative, legitimacy and authority. It makes deep connection (as ever) with the historical narratives of Korean liberation in 1945 and the pre-history of that moment; one embedded deep within the Mt. Baekdu discourse of guerrilla struggle. Mt. Baekdu as a historical revolutionary terrain and physical topography has been a focal point of recent North Korean narratological themes, connected where possible to historical figures and anniversaries (such as Kim Jong-suk’s 97th birthday commemorations in December 2014), and contemporary institutional agendas and processes (the use of Baekdu revolutionary architecture, monuments and sites as epistemic space for the ideological training of Pyongyang bureaucrats early in 2014). Of course Mt. Baekdu has long been a vitally important political stage for the authority of the family Kim; but further than this, the 2015 Address makes great play at the coagulation of as many themes as ideologically and linguistically possible in a single text, on the physical site and within the metaphysical remembered space of Mt. Baekdu. The biography of Kim Jong-suk recounts similar connections between the geography of Mt. Baekdu and contemporary North Korean political and institutional need, as well as, usefully for his revolutionary and political legitimacy, the physical and metaphysical characteristics shared by Kim Jong-il and the topography of Mt. Baekdu itself. Further to this, and extending the connection beyond the personhood of Kim Jong-Il and other members of the Kim dynasty, this year’s Address bestows the authority and charisma of Mt. Baekdu’s revolutionary topography upon the entire nation, its army, developmental approach and technological output. All Eyes on August? Transcending Liberation | Much of the metaphysical and narratological connectivity in the 2015 Address is aimed squarely at the lead up to the 70th anniversary of the liberation of the Korean peninsula from the Empire of Japan in August. However, this newly reasserted sense of revolutionary authority is not designed simply to alight on preparations for commemorative events marking the septuagenarian anniversary, but also to connect them to annual Workers’ Party of Korea founding ceremonies, all at “blizzards of Baekdu speed”. Possibly successful developmental strategies (even if only “successful” in a narrative or presentational sense) from recent years are also reconfigured to these aims, redeploying the wind themed narrative structure of early 2014. This reconfiguration is a trope of institutional and ideological focus common to many other periods of North Korean developmental history, moments of urgency and instances of Kimist demand. Fruit production, in particular rising apple production (the key focus of Kosan Fruit Farm), has a long, auspicious history dating all the way back to the agenda of the First Seven-Year Plan (1960-1967) and Kim il-sung’s landmark text, On Planting Orchards Through an All-People Movement (1961). Five Orchards and Two Fisheries Stations: Mountains of Gold | Of course it remains to be seen (and may never be) whether the citizens of North Korean became happier in seven or eight years due to the planting of orchards, nor whether they were planted with the manner or urgency envisaged by Kim Il-sung. Similarly, a feature shared with President Park Chung-hee of South Korea, Kim Il-sung’s desire to reforest his sovereign domain following the impact of the final extractive, destructive years of Japanese colonialism has long been a key feature of North Korean developmental aspiration. In the lea of 1964’s Rural Theses, Kim Il-sung’s Lets Make Better Use of Mountains and Rivers with its assertion, “Using mountains does not mean only living by them. In order to use them fully it is necessary to create good forests of economic value before anything else” (Kim Il Sung, 1964, p. 256), set the stage for extensive focus on timber resources, one which is again echoed in the 2015 New Year’s Message. Ultimately, the 2015 New Year’s Message reads akin to a hymn or paean to revolutionary stasis, a developmental treading of urgent water in anticipation of imagined new Utopian possibility. The Message’s diplomatic and political vision of trans-peninsular unification and Korean nationalism is configured with virulent aggression through the lens of Mt. Baekdu, anti-colonialism, perceived anti-imperialist victory and the embedding of revolutionary politics. This makes a non-starter out of any movement towards a resolution with those whom Pyongyang sees as the inheritors of colonial collaboration, the new colonizers, the old enemy and the not-so-new imperialist. Equally, 2015’s Message brings a developmental agenda frozen in urgent, assertive aspic. 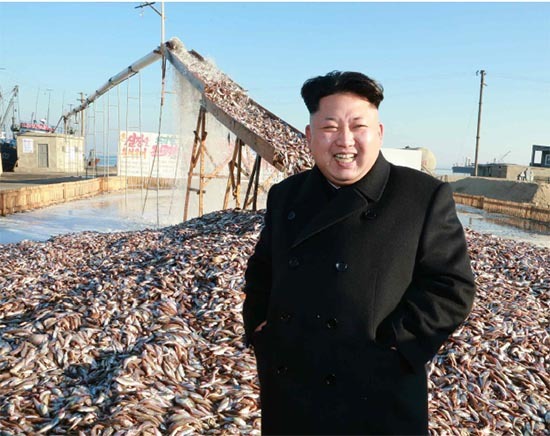 Perhaps KPA Unit 534 will bring in bounteous catches of pollack on the jetties of the January 8th Fisheries Station, revealing, as the New Years Message hopes, “a sea of gold”; however, for the North Korea analyst the counterbalance is the lead weight of history and narrative. Even in developmental terms, this Message required an acute awareness of North Korea’s revolutionary history to negotiate its sloughs and sumps.